Inherited enzyme variations, studied using electrophoresis, can be used as markers for the identification of individuals, population structure analysis, the delineation of species boundaries and phytogenetic reconstruction. 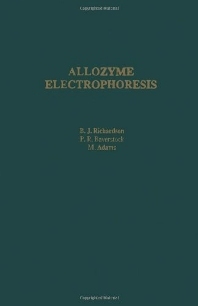 The purpose of this book is to describe, in a single convenient handbook, all the theoretical and practical matters relevant to those intending to use electrophoresis as a tool for answering such questions. Ecologists, biochemists, zoologists, and geneticists working on animal population studies or breeding animals for research purposes. Project Planning: Genetics. Electrophoresis. Population Structures. Systematics. Statistical Methods. Project Planning and Sampling Strategies. Collecting the Data: Sample Collection, Handling and Preparation. Electrophoresis Methods. Specific Enzyme Methods for Cellulose Acetate Electrophoresis. Strategies. Analysing the Data: Population Analysis. Using Electrophoresis Data. Analysis of Electrophoretic Data in Systematics. Other Types of Project: Other Biological Uses for Allozyme Electrophoresis. Appendixes. Bibliography. Index. Martin Adams is Professor of Food Microbiology at Surrey University, UK.